Some Muslim who were caught in the act of terrorism have been executed. According CNN news report, China executed 13 people Monday who were indicted on terrorism charges related to attacks on public places in Xinjiang province in recent months, according to China's Xinhua news agency. They were among dozens arrested and publicly tried after a government crackdown on terrorism in the region. Twenty-nine people were killed and 130 injured when men armed with long knives stormed a train station in Kunming in March. 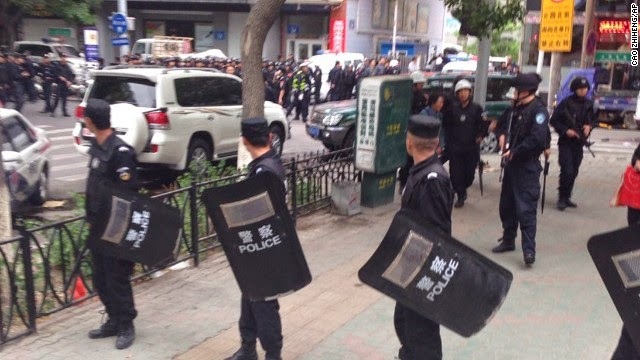 The next month, an attack on a train station in Urumqi, Xinjiang's capital, left three dead, including the attackers, and an attack on an Urumqi market in May killed at least 39. Those executed are believed to be close to or part of China's Uyghur minority, a mainly Turkic-speaking Muslim population. The Higher People's Court of Xinjiang, Uyghur Autonomous Region, found them guilty of organizing, leading and participating in terrorist groups; murder; arson; theft; and the illegal manufacture, storage and transportation of explosives, according to Xinhua. Some Uyghurs have expressed resentment toward China's Han majority in recent years over what they say is harsh treatment from Chinese security forces and Han people taking the lion's share of economic opportunities in Xinjiang. Amnesty International said Uyghurs face widespread discrimination, including in employment, housing and educational opportunities, as well as curtailed religious freedom and political marginalization. Dozens of others tried and convicted received sentences ranging from delayed death penalties to life sentences and other lengthy prison terms, according to Xinhua. Yu Huitang, a spokesman with the Xinjiang Regional Higher People's Court, said in May that "the sentences are a warning to those who have religious extremist thoughts and intend to incite violence." Chinese authorities say they apprehended more than 200 terror cells in Xinjiang last year and, according to Xinhua, China's leaders have "vowed to resolutely stop terrorism and severely punish terrorists."